We carry the largest selection of commercial outdoor dining chairs at discount wholesale pricing for swimming pool clubs, restaurants and all commercial settings. 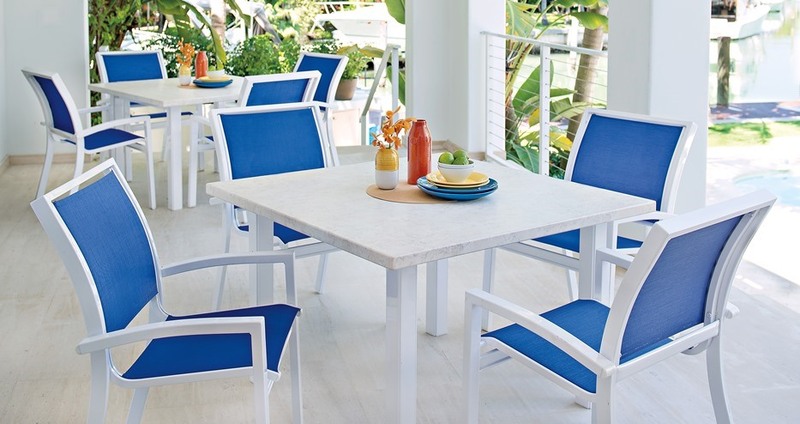 Our collections include sling, strap and commercial resin chairs, which are currently in use on patios at top resorts, beach clubs, pool clubs, homeowner associations, and hotels everywhere. We carry the entire Telescope Casual collection, including the Gardenella Sling Arm Chair, Vanese Sling Arm Chair, and Reliance Sling and Strap Arm Chair. Grosfillex offers their Miami Low Back Dining Chair, Havana Chair, Sanibel Arm Chair, and Acadia Arm Chair.